AverageBro: What's Up With Michelle Obama?!? What's Up With Michelle Obama?!? Bonus Beats from the prior post. The photographer who snapped the picture of President Barack Obama taking a “selfie” at the memorial for former South African President Nelson Mandela said Wednesday that there was nothing wrong with what the president did, and it seemed “perfectly natural” because of the festive atmosphere at the service. “For me, the behavior of these leaders in snapping a selfie seems perfectly natural,” AFP photographer Roberto Schmidt wrote in a blog post. But Schmidt dismissed these attacks and said he didn’t think about the impact his own photo would have. 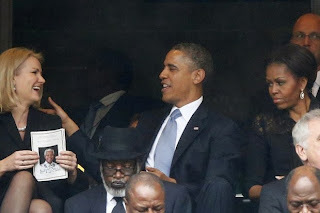 He also sought to dispel social media commentary that first lady Michelle Obama “seemed to be rather peeved” with Thorning-Schmidt because of her expression and glaring eyes in the photo. Cameron also addressed the selfie on Wednesday, saying it was initiated by Thorning-Schmidt. “When a member of the Kinnock family asked me for a photograph, I thought it was only polite to say yes,” Cameron said, as quoted by Huffington Post, which notes the Danish prime minister is the daughter-in-law of former U.K. Labour leader, Neil Kinnock. More pics, along with some commentary that I largely agree with. Republican Sen. Ted Cruz walked out of the memorial service for Nelson Mandela during Cuban President Raul Castro’s speech, according to reports. The Texas senator, who is of Cuban descent, was part of a congressional delegation that traveled to South Africa for the memorial service on Tuesday. Staging a "walkout" in advance, and having your staff send out a press release explaing that "walkout". Classy. Gotta hand it to Ted Cruz. The man can never resist an opportunity to make everything (even a memorial service!) about himself.